M2000A made its last QSO just before 1900z on Tuesday 29th February 2000 after two months of activity from English Heritage's Ranger's House on the Prime Meridian at Greenwich in South East London. M2000A made 47,000 QSOs in 200 DXCC entities. The operation is arguably the most successful special event amateur radio station ever. 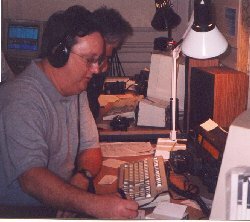 The station was manned by members of the Cray Valley Radio Society (CVRS) to celebrate the new Millennium and to provide DXers with the opportunity of working an amateur station located on the 0 degree Greenwich Meridian in the Millennium Borough of Greenwich. M2000A not only achieved the biggest QSO total made by an amateur radio station licensed for a period of only 61 days, but worked 200 DXCC entities, achieved WAS and WAZ, worked 100 islands and contacted 50 stations which were also specially active to celebrate the new Millennium. The amateur radio exhibition which was also set up at Ranger's House attracted nearly 1,200 visitors, some of whom saw amateur radio demonstrated for the first time. Included in the 1,200 total were 325 school children, local dignitaries, and 200 radio amateurs and short wave listeners (including several amateurs from overseas). QSL cards are now available. Requests received direct with sufficient return postage will result in a direct QSL card. Reqests which arrive via the bureau, or those without sufficient postage will receive cards via the bureau. Direct cards are being send out now. The M2000 Awards and a video will all be available soon - details will appear here in due course. Also look out for details of our special Activity Days aimed at giving amateurs worldwide the opportunity of contacting CVRS members in order to qualify for the WCV 2000 Award (details elsewhere on the M2000A website).